The SS Oregon was operated by the Cunard Line and was carrying 598 bags of mail from England to New York when she sank following a collision with a schooner believed to be the Charles H. Morse off Fire Island, New York. The accident occurred on 14 March 1886 and all 896 passengers and crew on board were saved by a number of rescue ships and 464 bags of mail were washed up and recovered on beaches from Portland, Maine to Cape Hatteras, North Carolina. 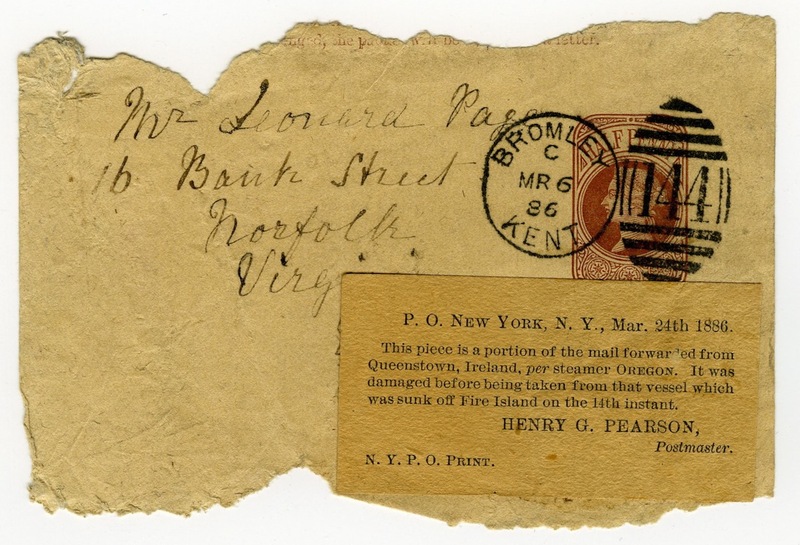 Salvage took place over several months and each time more mail was recovered the New York Post Office applied a different label recording the delay to the mail.